A Kansas represented by the outgoing HHS secretary would tell Democrats to get over their timidity. The anti-Obamacare machine that has been so carefully assembled by the Koch brothers and their billionaire boys club would surely blow a gasket. The right-wing echo chamber would go nuclear. And the Republican National Committee, Mitch McConnell and all the senators and contenders who have staked their 2014 prospects on a run against healthcare reform would make a big deal of laughing out loud. But among the savvier of their number, it might well be a nervous laughter. What could cause all this consternation? Democrats have urged departing Secretary of Health and Human Services Kathleen Sebelius to run for the US Senate from Kansas. A Sebelius spokesperson discounted the prospect, saying she was focused on the transition out of her current job. But The New York Times reported that Sebelius, who served two terms as the Democratic governor of Kansas during the Bush years, was considering the prospect of challenging US Senator Pat Roberts, a relatively drab conservative Republican who is currently facing a primary challenge from a vaguely more interesting conservative Republican. 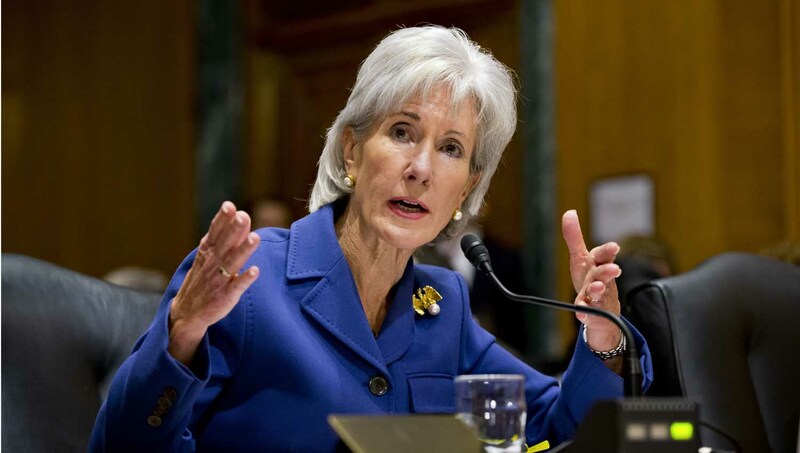 A Sebelius run remains an unlikely prospect. The outgoing cabinet secretary has been through a lot over the past few months, and the notion of turning around and seeking the Senate from a state that has not elected a Democrat to the chamber since 1932 would definitely qualify as daunting. That is undoubtedly the case—if the country remains forever locked in November 2013. But the politics of November 2014 won’t look anything like the politics of November 2013. Indeed, those who actually turn the pages of their calendars recognize that a lot has already changed since Obama and the Democrats hit the political skids late last year. The Affordable Care Act, implemented by Sebelius, is now exceeding goals. More than 7 million Americans were signed up by late March. And less than a month later, as noted by President Obama a press conference Thursday, the figure has risen to 8 million. Another 3 million people have enrolled in expanded Medicaid and children’s insurance programs. And the overall number of Americans with healthcare coverage will increase by millions more before the end of 2014. That does not mean that every voter has forgotten about the complexities and controversies that attended the first stages of Affordable Care Act implementation. Nor will it alter the view of millions of Americans (including this writer) that Obama, Sebelius and the rest of the administration should have embraced a single-payer “Medicare for All” initiative, rather than the complicated and expensive Affordable Care Act model. But access to healthcare is expanding rapidly in America. And attitudes toward the Democrats who have advanced reforms are changing just as rapidly. The latest Reuters-Ipsos poll finds that since February support for the Democratic position on healthcare reform has been on a steady rise, while support for the Republican position has been just as steadily declining. The most recent survey, released this week, found that 32 percent of voters favored the Democratic position, while just 18 percent thought the Republicans offered a better approach. President Obama’s job approval numbers have experienced a similarly steady pattern of improvement. In early December, the Real Clear Politics average of major polls found that disapproval of Obama led approval of the president by 16.1 points. By this week, that number had been cut almost in half, to 8.3 points. The most recent McClatchy/Marist poll puts Obama at a 45 percent approval rating, while a new Rasmussen Reports survey has him at 46 percent. That’s below the 51 percent support the president received in his 2012 re-election run, but it is worth noting that, in April 2012, the Real Clear Politics average had Obama at just 47 percent. Which brings us to Sebelius. Most Americans know her only as a member of the president’s cabinet. But before she came to Washington she was the Democrat who cracked the code in Kansas. A state representative who focused on consumer and healthcare concerns, Sebelius was elected to the Kansas state House during Ronald Reagan’s second term, and re-elected when George Bush was carrying the state with ease in 1988 and 1992. In 1994, the year that a wave election swept Republicans into control of the US House and US Senate (with Kansan Bob Dole as majority leader), as well the governorship of Kansas, Sebelius upset the Republican calculus and won a populist campaign for state insurance commissioner. She blocked insurance industry mergers and made a name for herself defending the rights of women, got re-elected with ease and was named as one of Governing magazine’s top public officials in the nation. Eight years after her initial election as insurance commissioner, Sebelius took on an even bigger challenge. In 2002, a year that was looking to be very good for Republicans, especially in Kansas, she ran for and won the governorship by a 53-45 margin. Four years later, she was re-elected with 58 percent of the vote. Her ability to win big in a red state inspired rounds of speculation about vice presidential and even presidential prospects for Sebelius, who chaired the Democratic Governors Association in 2007. For those who know Sebelius only from the headlines of the past few months, the prospect of a Kansas run this year may still be hard to imagine. But Sebelius has a record in Kansas—both as an administrator and a candidate. Does that mean she is destined to win? Of course not. Republicans openly mock the prospect of her returning to the Kansas ballot. There’s no question that Sebelius has taken a battering from the GOP over the past six months, nor is there any question that as a candidate she would take a battering from the GOP over the next six months. Additionally, there are cautious Democratic strategists, in Kansas and nationally, who recognize that the party’s position is improving and don’t want to take any risks that might alter that trajectory. But it is simply unrealistic, not to mention politically foolish, to assume that the 2014 election script is so deeply written in stone that surprises will not occur. Sebelius was an unlikely winner in 1986, 1994 and 2002. Were she to run this year, she would energize grassroots Democrats in Kansas—even if she would have to persuade them to reconsider their support for the able contender who is already in the race, Shawnee County District Attorney Chad Taylor—and nationally. A Sebelius run would at the very least make the Kansas Senate contest a referendum on healthcare reform—and on the broader question of whether it makes sense to try to solve problems in an age of gridlock, obstruction and political pettiness. If popular sentiment continues to trend in the direction of the president and his party when it comes to the question of how to address healthcare issues, Sebelius could find herself in a position to argue that, against all the naysaying, the United States remains a country that can actually take on great challenges and master them. The troubles she experienced along the way don’t necessarily undermine that narrative, as big tasks are never accomplished easily. If Sebelius were to run in Kansas, with a recognition of the challenges she faced but with no apologies for taking on the second toughest job in Washington, she would be campaigning not on defense but on offense. And if there is one lesson that Democrats would be wise to learn, it is that there are advantages to playing offense. That’s a lesson Sebelius has known since she was a young woman. In 1964, her father, John Gilligan, was elected as a Democrat to represent a traditionally Republican region of Ohio in the US House. He voted as an unapologetic liberal, giving especially enthusiastic support to the Social Security Amendments of 1965, which created Medicare and Medicaid. His positions were not popular with a lot of the voters back home, and he was defeated in 1966. Two years later, he lost a race for the United States Senate as an unabashed anti–Vietnam War liberal, and a lot of pundits said his run was done. Then, in 1970, he bid for governor of Ohio and won a contested Democratic primary in a year when President Richard Nixon, Vice President Spiro Agnew and a lot of pundits were predicting a backlash against enthusiastic supporters of civil rights and social welfare programs. John Gilligan refused to buy into the calculus that said 1970 would follow the script that Nixon and Agnew imagined at the start of the year. He rewrote the script, and he won that gubernatorial race by almost 350,000 votes. The only sure way to lose an election is not to run. If Kathleen Sebelius were to bid for the Senate this year, she would challenge not just an often inaccurate conventional wisdom but the Democrat Party’s tendency toward an excess of caution. And that, in turn, could reshape the debate about healthcare and a whole lot more.